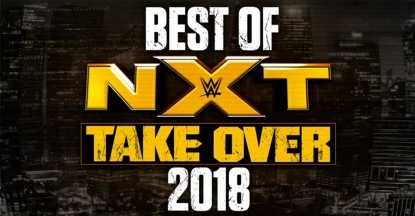 Last year, we had a three-disc collection of NXT’s best matches from 2017, which covered TakeOvers and the weekly TV show. This time, we’re one disc down, and the spotlight is solely on the five TakeOver specials held in 2018. This isn’t necessarily a bad thing, though, because NXT TakeOver events are generally superb, and every single TakeOver from the year just gone (well, it ended three months ago now) was either a four- or five-star night of wrestling action. Ergo, one would expect a best-of from these cards to be something special, and that proves to be the case, because this eleven-match “Best of NXT TakeOver – 2018” DVD is absolutely fantastic. Let’s take a closer look by breaking things down, match-by-match! TAKING OVER!! 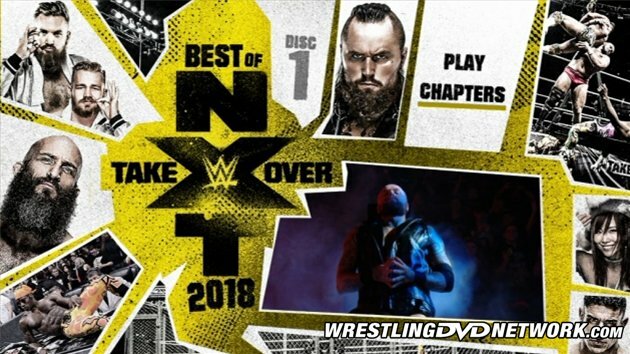 Grab the first NXT TakeOver DVD on Amazon.com (USA) or Amazon.co.uk (UK). Well, it was Philadelphia after all. It’s a bit forgotten amongst other major NXT battles, but this is a very good no-rules contest and a strong start to the DVD. At the time, it still seemed like Adam Cole was destined for NXT Championship glory; in terms of the brand’s top title, he may finally be about to win it at TakeOver: New York. This has been described by many as the best match in NXT history, and that may very well be the case. It has a simple structure, but it grows and grows and grows to a truly exhilarating finale with plenty of outstanding near-falls, a plethora of big moves and a wealth of drama. Andrade retains the gold, but Gargano could take comfort that he and the then-NXT Champion had delivered a masterpiece. I covered this last year when reviewing the WrestleMania 34 DVD (with NXT TakeOver bonus disc). I will simply add here that it’s a superb match, maybe a little on the long side, but it’s an incredible effort from all involved. It’s a must-see contest on a collection packed with bouts of a high standard. This is a strong showcase of two rising stars on the NXT brand at that time (Ricochet is now a RAW regular; Velveteen awaits his big roster move while currently holding the North American Championship). On any other collection, this would be one of the most enjoyable matches included. Here, it fades into the background a bit, but it’s still well worth watching as an athletic showcase of two future WWE main eventers. Though some (like me) would have preferred to see their previous showdown from New Orleans on the DVD, this rematch is still an awesome battle, and the third straight TakeOver classic for Johnny Wrestling. The positively evil Ciampa takes a ferocious beating from Gargano, who was slowly beginning to incorporate traits of the man he most despises, yet he still finds a way to win against the odds, and does so while retaining his scorching heel heat. The NXT tag team formula has been pretty well-established: old-school tag team wrestling and double-team offence by the heel combo, before the hot tag leads to a spirited babyface comeback, before one major near-fall leads to a frenetic finish. That is once again followed with this contest, a cracking doubles battle that is a wise choice, given that it may just be the best NXT tag team match of 2018, at least on the TakeOver stage. In case you didn’t know that Ricochet was awesome, this marks his third appearance on the DVD, and it isn’t his last. In fact, all four of his TakeOver matches last year are included, which sends a message I’m sure. In this case, it’s another thriller against the leader of The Undisputed Era, as the two engage in a back-and-forth battle that keeps fans guessing on the outcome. One of the more underrated feuds on NXT in 2018 concerned the Women’s Championship saga between Shayna Baszler and Kairi Sane. Their rivalry extended to the final of the Mae Young Classic, and the seemingly-unstoppable Baszler is defeated here by Kairi persevering and using basic ring smarts. The action is very good, making this another triumph, though the hostility between these two would roll on into the autumn. In terms of big-stage performances, Johnny Gargano had one of the best years ever of any WWE competitor. Having stolen the show against Andrade and put together three tremendous battles against Ciampa, he rounded off his 2018 of TakeOver wars here against Aleister. It would be easy to just provide a performance that is “good enough”, or for this bout to just feel a notch below his other big matches last year. But instead, this is friggin’ awesome, and Black damn nears takes Johnny’s head off with the final, match-winning Black Mass. Matches like this make it look easy to put on a great showing at NXT TakeOver events, but one has to remember the high standards that have been set for these shows, as well as the knowledge that talent has to be truly special to receive these opportunities. Even so, Ciampa and Dream pull off their task almost effortlessly with another gripping battle, one that has the fans on the edge of their seat as they hope for Velveteen to claim his biggest ever win. That doesn’t happen as Ciampa retains, but what a battle this is. Rounding things off is NXT’s second annual WarGames match, and it’s even better than the excellent 2017 showdown. This bore more similarities to the vintage WarGames battles in WCW due to it being four-on-four, but whereas The Match Beyond would never last too long in WCW rings, here it marks the real beginning of this tremendous fight. There are more high spots and near-falls than you can shake a stick at, and it has a happy ending with Ricochet and Pete Dunne both pinning Adam Cole for the babyface victory. 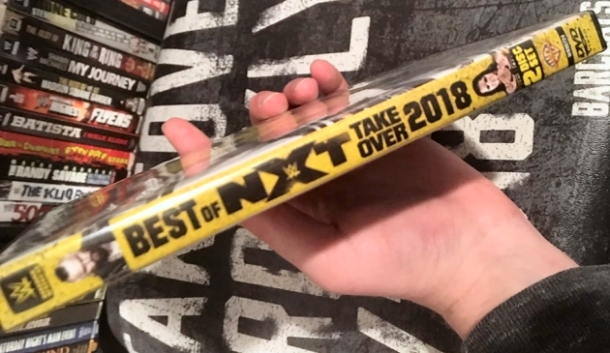 “Best of NXT TakeOver – 2018” is an awesome DVD collection. And, yes, the word awesome has been used a lot in this review! Short of including every single TakeOver match (and to be fair, most of those omitted would have still been worthy of being featured), this two-disc compilation could not be much better. The worst matches here are still very good, there are many fantastic battles, and there are a couple of bouts which could legitimately be described as outright classics. With the bar set that high, you know that you’re in for a treat with this. I strongly suggest checking this one out; from an in-ring standpoint, it is and will likely remain the best WWE DVD release this year. When is Wrestlemania 35 coming out on DVD? Never mind saw it was May 14th awesome!